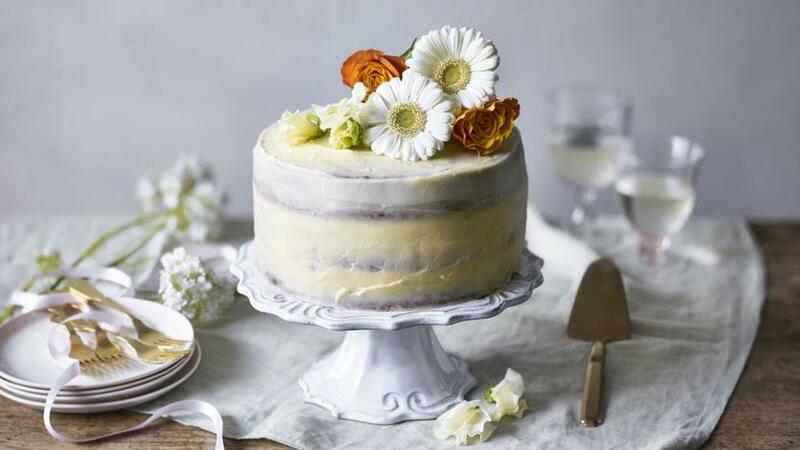 It's the cake of the season - inspired by the royal wedding, this easy lemon and elderflower cake will win everyone's hearts. Preheat the oven to 200C/180C Fan/Gas 6. Grease and base-line three 20cm/8in loose-bottomed round cake tins with baking paper. Put the butter, sugar, salt and lemon zest into the bowl of a stand mixer fitted with a paddle attachment and beat until pale and fluffy. Gradually beat in the eggs, one at a time, adding a spoonful of flour occasionally to prevent the mixture from splitting. Fold in the remaining flour and the ground almonds, then fold in the elderflower cordial. Divide the mixture equally between the three tins and bake for 20–25 minutes until risen and golden. To test that the cakes are cooked, insert a cocktail stick or skewer into the centre; if it comes out clean the cakes are ready. Transfer the tins to a wire rack and use a cocktail stick or small skewer to prick holes all over the surface of the sponges. Mix together the elderflower cordial and lemon juice and spoon over the sponges. Leave to soak and cool in the tins for 30 minutes, then turn out and leave to cool completely. Put a spoonful of buttercream onto a cake stand or serving plate, then lay one of the sponges on top (if they’ve domed slightly during baking, trim with a bread knife to flatten the tops). Spread the sponge with a little of the buttercream then lay a second sponge on top. Repeat the layering process then spoon the remaining buttercream on top of the cake. Use a palette knife to spread the buttercream over the tops and sides of the cake in an even layer. Finally turn the cake whilst holding a palette knife down the side to scrape away some of the buttercream so the sponge is visible underneath. Decorate with fruit and fresh flowers and serve.